When you are opting for cannabis cultivation indoors, you cannot provide the same area for the plants as compared to when they grow outdoors. That is why you have to control the direction in which they grow and the area in which they grow. 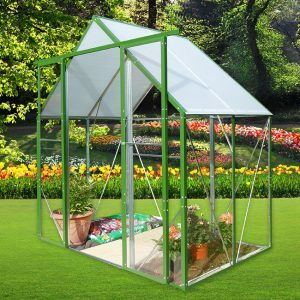 That is why selecting the right greenhouse is very important. Marijuana growing indoors is not an easy task. However, if you can avoid the stretching of the plants, it will indeed become much easier for you to grow them in a smaller space. Before we go into the details of how to avoid stretching, we will shed some light on what exactly is stretching of cannabis plants. Stretching is the natural vertical growth of the cannabis plants. This growth occurs in spurts. The natural vertical growth often occurs during the early stage of flowering. If you are able to control this natural growth, it will become easier for you to grow more plants in a smaller amount of space. We will now share with you 3 simple tips which you can follow in order to avoid the stretching. You need to keep in mind that you have to look at the strains which you are selecting. According to genetics, some of the strains will stretch no matter how much you try to avoid it. These are Sativa and Sativa-dominant hybrids. Thus, if you want to avoid stretching of the cannabis plants, it is a much better idea for you to avoid these strains. On the other hand, when you are opting for the Indica strains, you can be sure that they will not stretch by a similar amount. Thus, the 1st step which you can undertake is to choose the right kind of strains. When you’re setting the temperature such that it is much higher during the daytime as compared to the night, gibberellin is produced in the plants. This substance causes the plants to stretch much higher. The perfect solution to this problem is to ensure that the difference between the daytime temperature and the night temperature is just 5. On the other hand, if you want to drastically control the stretching of the plants, you can make the nighttime temperatures higher as compared to the day. In order to do so, you need not make the entire daytime temperature lower as compared to the night. Most of the stretching occurs during the early hours of the morning. If you are able to keep the early morning temperature at 5 below the rest of the daytime, automatically the stretching will be reduced considerably. This technique is known by the name of cool down. With the help of this technique, it will become easier for you to avoid the stretching of the plants. When the illumination in the greenhouse is on the lower side, this problem can often occur. In order to gain access to proper light, the plants will grow up taller. As a result, they will also have weak stems. Additionally, the plants will be pretty weak which will increase the risk of the plants being impacted by pests and mould. The perfect solution to this is to use multiple light sources. With the help of multiple light sources, you will be able to provide proper illumination. As a result, stretching will be greatly reduced. When the stretching reduces, the plants will grow horizontally as well which will place pressure on the stem. Thus, the plants will be stronger. This will help them fight other insects as well as pests. Thus, the marijuana growing plants will be much stronger and the end product which you will get will be better as well. In order to reduce the stretching, avoiding overcrowding of the plants is also a good idea. Thus, when you’re looking to avoid the stretching of the plants, these 3 simple tips will help you in doing so. You need to, however, keep in mind that only when you’re following the steps right from the start, you will be able to avoid the stretching. Each and everything which you will need in order to grow marijuana indoors is sold in our store.